Hemodynamic Rounds, Fourth Edition is intended to help cardiologists, cardiovascular fellowship trainees, residents and other members of the medical community enhance their understanding of cardiac physiology and its associated hemodynamic presentations in health and disease. This includes the basic principles of flow and pressure measurements, systemic as well as coronary hemodynamics in normal and diseased states, and changes in hemodynamics following interventional procedures ranging from TAVI and valvuloplasty to stent placement. Like its popular predecessors, this new edition draws on case studies to illustrate characteristic cardiac hemodynamic findings and discusses the essential methods used in interpreting pressure waveforms as a diagnostic and monitoring tool. 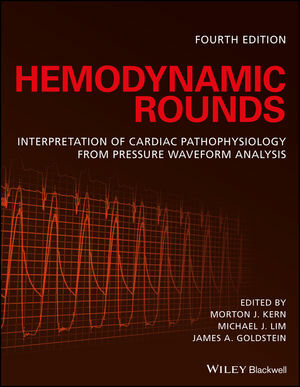 Hemodynamic Rounds: Interpretation of Cardiac Pathophysiology from Pressure Waveform Analysis, Fourth Edition is an indispensable tool for all physicians, nurses, and students responsible for measuring and interpreting cardiac waveforms in cardiac diagnosis and monitoring. MORTON J. KERN, MD, MFSCAI, FAHA, FACC, Chief of Medicine, Veterans Administration Long Beach Health Care System; Professor of Medicine, University of California, Irvine, CA, USA. MICHAEL J. LIM, MD, Chief of Cardiology, St. Louis University, St. Louis, MO, USA. JAMES A. GOLDSTEIN, MD, Director, Cardiovascular Research, William Beaumont Hospital, MI, USA.